A GFXBench score sheet just showed up listing a good portion of what is believed to be the next mainstream Xperia flagship, the Xperia XZ3. Some of the specs were already known, but there are a few other surprises along the way. 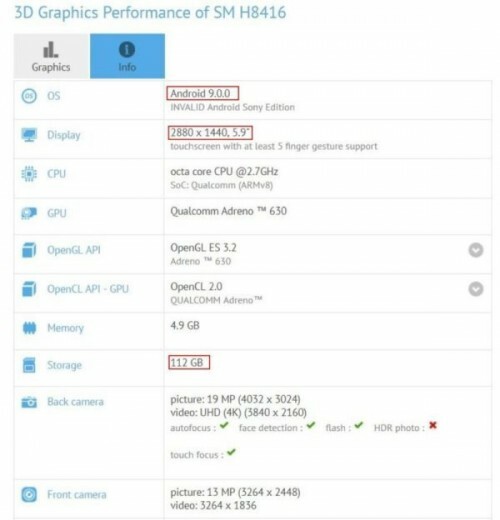 The model number of the phone is H8416 and carries an Adreno 630 GPU, which means Snapdragon 845 is in tow along with 6GB of RAM and 128GB of internal memory. The device also runs on Android 9.0 P. Everything seems to be in line with the previous report but contradicts the latest one showing off a dual camera setup on the back. Either the software didn't recognize the second sensor, which is believed to be 12MP, or the benchmark has been run on an early pre-production sample that skips the secondary sensor. Still, it's safe to assume that the Xperia XZ3 will have the same camera setup as the XZ2 Premium, given the last three leaks - 19 MP (25mm, f/1.8, 1/2.3" 1.22µm) paired with 12 MP B/W (f/1.6, 1/2.3", 1.55µm). What's more interesting is that the listing reveals higher screen resolution than initially expected and slightly bigger diagonal. The score sheet shows 5.9-inch display with 1440 x 2880 (QHD+) resolution and it's going to be the first Sony handset with such resolution. Impressive specs Sony with thus flagship beaSt.